Apologies first. I’m way behind in checking out everyone’s blogs – after this weekend things should settle back down and finally take some time to catch-up. On the Lookout, a graphite drawing (12×9) was done on Strathmore Bristol Vellum paper – has been completed. I did cheat and worked on the piece on and off during the week – I really couldn’t help myself. The Heron was pure joy to work those feathers – a mindless activity and very relaxing. Speaking of feathers the pencil values ranged from 2H all the way through to 4B, and in between I also used loose graphite to darken large sections of the feathers and then used the graphite pencils for the finer details and definitions, and the really dark areas. A kneaded eraser was used for highlights in the water, sky and feathers. This drawing took about 16 hours in total. This Heron reminds of one that comes our way during summer months and sits high up in our old Oak tree – very hunched looking for food (after he cleans his feathers, of course). He is an amazing bird and literally stays up there for several hours being very patient – just waiting and always On the Lookout! Thank you for checking in and following along with the progress of this drawing project. Click onto the image for a larger view. The reference image was from Paul2 of pmp – an incredible photographer, whose work is always remarkable. The image was a shot he took at sunset (in color) at Kensington Gardens – London. 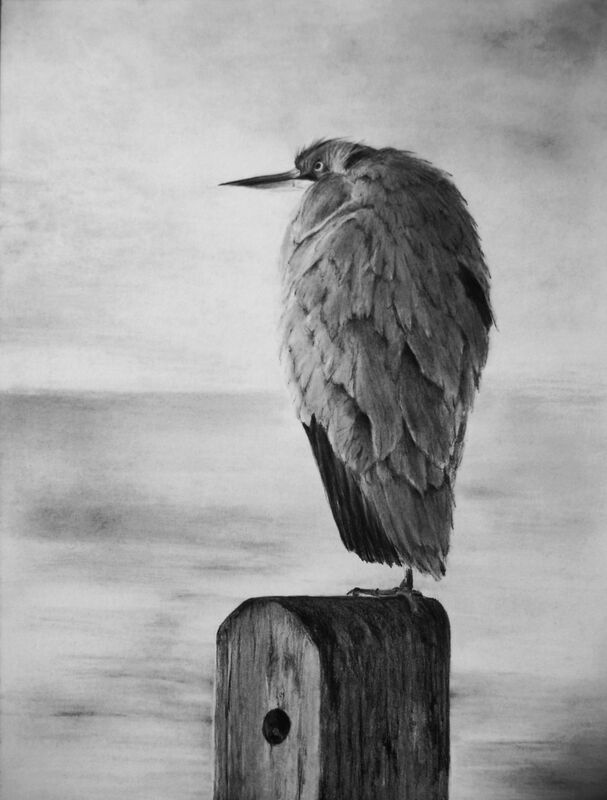 This entry was posted in Drawings, Thursday Drawings and tagged bird, drawing, graphite, heron. Bookmark the permalink. Hi Rita, happy new year! Thanks so much for your generous comments, it was a great scene to draw – learned a lot and had fun while I was drawing! Thank you so much Patricia for such a lovely comment and compliment – you’ve made my day. I’m glad you enjoyed the piece. Wow. That’s very skilled technique, Mary. I think such textures and shades must be very difficult to draw. Are they? Thank you so much Cynthia – love your question. The shades are developed by analyzing/drawing from the darkest areas to the lightest, those extremes gives the contrast and a 3d experience to the viewer. Not having the correct shading (values) can easily throw a drawing or painting off, it can be difficult to draw the subtle differences sometimes (very easy to miss when analyzing how to approach a piece). Textures are a lot of fun to incorporate into a piece, it helps to have a very sharp pencil point with a lead that is a darker shade than the background of the area that will be textured, if the area is too close to what the texture will be it won’t stand out. Probably more than what you wanted to know – thank you for such an interesting question. It’s a great answer. I didn’t realize that’s how it works. Thank you. Thank you Simla – really appreciate it! Wow – this is just fabulous!! you are welcome…it is a pleasure. Thank you my friend for being so enthusiastic, you know your birds. I’m happy you enjoyed this Heron! He is absolutely stunning!! Wonderful work, Mary. Thanks Heidi for being so generous in your comments! Thank you Graham – appreciate your feedback! Amazing work, Mary! I like the details very much (as you may know from my pet portraits) and you did them really well and also your tonal approach is great! Thank you so much Alexandria for your thoughtful comments on the drawing – appreciate your artist eye w/re the details and values. Every time I walked past the drawing I kept seeing little areas that stuck out for adjustments and refining. I’ve not drawn very many birds or animals, so this was a good learning experience on the elements for this close-up. Thank you so much Dsaquarelles! The heron looks amazingly real, sad and alone in the winter. It’s one of your best works, Mary …wonderful! Thank you Maniparna for your lovely words – have a beautiful weekend. Mary, this piece gave me chills and goosebumps!! No exaggeration. Haunting and breathtaking, all at once! And you would be an incredible pen artist. Seriously. I’ve been loving pen lately and I would love to see what you’d do with some good pens!! Laura you know how to make my day. Thank you for sharing your response to the piece, that means a lot. I enjoyed working this scene out and graphite was the perfect medium to do it. Thanks again, I&P medium – maybe one day, we’ll see (love your enthusiasm)! Thank you Pauline, wow what a comment and much appreciated. I love pencil, gives me a whole lot more control than painting. It isn’t framed yet, but this one will probably be – thanks for your enthusiastic response to the drawing!! Quite the lookout …. and I also sense a brisk wind. Thank you Frank, I always appreciate your encouragement. Oh those fierce winds are kicking up!! Really beautiful! ❤️ great work, Mary!! Thanks Linz, much appreciated and nice seeing you! awesome drawing Mary. I took a look at you work and you are very talented! This is absolutely outstanding in every way Mary. You must submit this in a competition!!! It’s an award winner! We saw a great blue Heron sitting on the dock in the rain a few days ago. He was huge! Wish I could have got a photo. Wow Rhonda, thank you. It was a great drawing project to wrap the year up. Very cool that you got to see a Heron, don’t you just love the Blue Heron’s so big – love their deliberateness. If you can imagine the one that hangs around here sits up in our old Oak tree, it’s the funniest thing to see how he squishes himself (wings and all) just to have a particular perch during the blazing summer heat. Pretty cool. Have a great weekend. Thank you very much Nicodemas! Thank you so much Marina for your kind thoughts and encouraging words – have a beautiful weekend my friend. Looking forward to seeing what you have been up to lately! Mary, this is incredible! It looks like an old black & white photo. Doing the feathers may have been a mindless relaxing endeavor, and they are certainly realistic. Thank you my friend for your beautiful comments – love reading your thoughts on the piece. I’m so glad you enjoyed it Resa, and I do have to say I’m always relaxed when I draw with granite and I can’t explain why. Have a great weekend. Thank you so much AND Winston it will be. Let’s name him Prospero!! A gorgeous drawing, Mary, but then I wouldn’t expect anything less. I think it takes a most perceptive eye and great skill to work from a color photo into this beautiful black and white. Love reading your thoughts Cynthia and always appreciate the time you spend considering my art pieces. Thank you so much – I had a feeling with this piece before I started and could see where I wanted to take it, thank goodness it worked out. I really do enjoy graphite, many options for creating with the medium. One day I want to try ink (man, what did I just write?)! Ink has its joys too. Onward and upward! It’s so precise though, I just don’t know if I dare do it? We’ll see – you must be laughing at all this Cynthia! I’m not laughing at all, Mary, if you mean a mocking kind of laughter. I only chuckle at your reluctance to trust yourself….been there, done that. I have done pencil drawings and ink drawings and they do demand different skills (undeveloped, in my case) but it’s all fun and the urge to really “see” and record what’s true to your vision is always there and quite worthy. ( I draw only as a meditative practice, now, whatever is around, wherever I am. It quiets the mind, and actually helps with poetry!) I truly admire the way you go about what you are doing, so keep doing it! Oh no, pure good fun – my Gemini side is always kicking up and urging me to new directions. Your discussion on the differences and similarities of the two mediums is very interesting. I think it will be a while before I attempt ink, but I’ll leave it out there as a possibility one day. Interesting that you draw to quiet the mind, no doubt it helps with poetry, drawing kind of puts a blinder on for me w/re to everything else going on and seriously helps me relax. Maybe that’s why I like it so much. Thank you for your ever-present support with my creative energies – hope you have a wonderful weekend my friend. Please, please, please try ink, Mary!! Oh, you’d be an ink magician in no time!! Maybe one day. It seems you need to be more precise in your initial drawing with ink, no erasing (ha) and my initial work isn’t always as precise as it probably should be. I need more time and work in this area and maybe I’ll give it a try some day down the road. Always appreciate your encouragement and support! So great that you took the time to check on the drawing Janet. Thank you very much for your thoughts on this piece and your wonderful comments – always appreciated. Hope you have a wonderful weekend and making progress on your book! A most incredible drawing Mary! Your Heron is magnificently detailed to the last feather, the set of skills you used on this bird is truly amazing, you totally captured the essence and the character of the bird. Love the minimalistic background, with it’s softness and subdued values it frames perfectly the focal point of your theme. Even do he is just sitting and waiting covered with soft feathers, the concentration and intensity of his gaze is the perfect opposite for that softness. I must congratulate you on what I consider one of your best work! Thank you so much Eva for your thoughtful feedback and analysis of the drawing, this piece was a pleasure to draw and gave me something to really sink my teeth into. Thank you for noticing the details and nuances of the scene, love how you work into the entire scene – such a pleasure to read your comments. Thank you for always being present and generous. Amazing drawing, Mary! You have captured the heron in all of its natural splendor. Thanks so much for your generous comment – you know your birds and appreciate your great compliment!! It really is a marvellous piece of work Mary. The feathers are so beautifully done. Thanks so much Don, appreciate your artistic eye on this piece. Have a great weekend. I really enjoy your posts and find your tips really helpful. My work is not presentable to others, but I do enjoy the creative outlet…Have a wonderful holiday season. Such a compliment Charlie, thank you very much for your feedback and comments. Awesome that you create – it is a great outlet especially drawing, you can virtually do it anywhere. Have a great holiday! your drawing is superb!! well drawn with spirit 🙂 its amazing how you handle the graphite Mary, lovely. Thank you Debi for your kind comment. I have a great time working with graphite, it is a relaxing medium that allows me to just enjoy the whole creative process. Thanks Sylvia – you know your Herons! Thanks for mentioning the feather details! Have a great weekend. Stance captured beautifully and love those darks and lights. Thank you, appreciate that you caught the elements – the values have made the Heron come alive. Thanks Amy – appreciate the time you take to examine my drawings and this one in particular. I’m glad you enjoyed the feather work! Looking forward to seeing what you have been up too. Yowza! Mary, this is incredible! I hope everyone clicks on the photo to enlarge.Well done! Thanks Jill for your enthusiasm!! Thanks for the reminder on “clicking onto the image for a larger view,” forgot to put that in my write-up. It really was amazing, Mary. Beautifully drawn and I especially like the way you have captured his feathers. Thanks Anna, I really appreciate your feedback. Love working the feathers, delicate yet they needed to show some strength. Your Heron is majestic, Mary. All the details in the feathers is amazing. Your joy comes through. Hope all is well! Hi Geralyn, thanks very much! Glad you like the feathers, they were a bit of work, but fun to watch develop. Really appreciate. Slowly, but surely I’m catching up – hopefully after this weekend, I’ll be able to get on a regular pace again. Hope you are well and have a wonderful weekend. Thank you for your lovely comment Sibella!